Today, the Rangers start the final pursuit of Lord Stanley’s most precious cup for the first time since the days of Messier and Richter. So let’s find you a rooftop or somewhere outdoors to watch this happen, shall we? 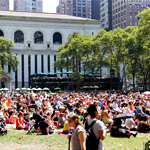 You require: Somewhere to really feel the Rangers-fan brotherhood... in a park. You require: The un-sports-bar, 18 floors up. 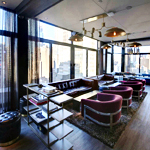 You’ll receive: Reposado cocktails and a large flat-screen imported just for the game on a SoHo rooftop. Also: a pool to host your postgame analysis. Which is sure to be astute. You require: Fresh air and beer fraus. 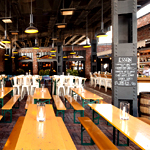 You’ll receive: The expansive outdoor greatness of the Standard Biergarten, with all its sausagery, large mugs of frosty refreshment and two 90-inch screens for noting every detail of how King Henrik shuts down Gáborik. Positive thoughts. You require: Tons of fans, plus encouragement to drink beer. 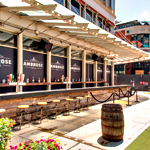 You’ll receive: The brand-newly-opened Ambrose Beer Garden and Ambrose Surf Club, a couple Seaport spots with beer programs from the Clinton Hall guys and an army of flat-screens showing the games. You’re a noise complaint waiting to happen. You require: A cocktail created purely for this occasion. You’ll receive: The Stanley Cup, made with applejack, pomegranate liquor, lime and ginger beer. And their regular cocktails will be available in pitchers, which is trouble. Oh, and it just happens to be one of the city’s greatest indoor/outdoor rooftops.